V e g a n D a d: Happy St. Patrick's Day! 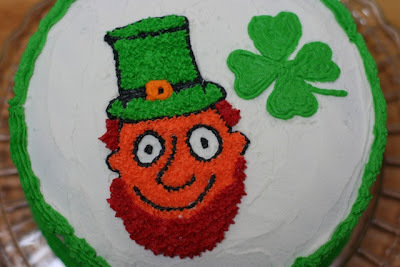 The kids and I decided that the best way to celebrate St. Patrick's Day was with a cake. Yes, nothing honours the death of a saint from the 400s like cake. But not just any cake: green marbled cake! I made two batches of Isa and Terry's basic vanilla cupcake recipe, and dyed one green with Wilton's gel dye. 1/4 of the of plain batter went into a buttered and floured 8" cake pan, followed by 1/4 of the green batter, then 1/4 of the white, and 1/4 of the green. I repeated with a second 8" pan, then used a knife to slice through the batter to get the marbled look. I then baked the cakes for 22 mins, as per the recipe. The frosting is Isa and Terry's buttercream frosting. After laying down a layer of frosting, Son #1 drew a picture of a leprechaun on it with a toothpick, and I filled it in with frosting. Son #2 suggested the shamrock and Son #3 licked all the bowls clean.